What do you know about the musical families? Research the instruments in ArtsEdge Perfect Pitch and write those instruments down under the correct family in the handout. 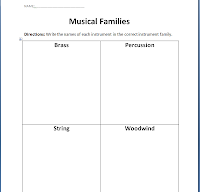 Then, can you create your own orchestra with the instrument families that Mr. Horne asks for?